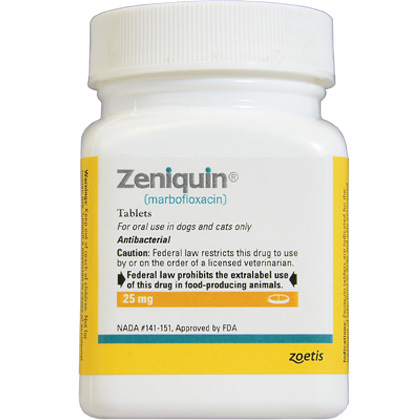 Zeniquin is a broad spectrum antibiotic used for the treatment of bacterial infections in dogs and cats, such as skin and soft-tissue infections and urinary tract infections due to organisms susceptible to marbofloxacin. The tablets are film-coated and easy for your pet to swallow. Zeniquin requires a prescription from your veterinarian and is sold by the tablet. Zeniquin is a fluoroquinolone antibiotic that works by inhibiting bacterial DNA replication. For use in pets only. Keep out of reach of children. Avoid contact with eyes. In case of contact with eyes, immediately flush eyes with copious amounts of water for 15 minutes. In case of dermal contact, wash skin with soap and water. Consult a physician if irritation persists following ocular or dermal exposure. 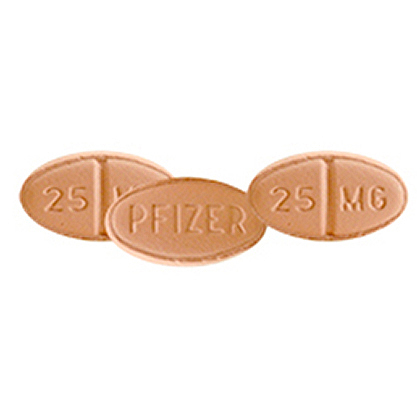 Individuals with a history of hypersensitivity to fluoroquinolones should avoid this product. In humans, there is a risk of user photosensitization with a few hours after exposure to quinolones. If excessive accidental exposure occurs, avoid direct sunlight. Quinolones should be used with caution in pets with known or suspected central nervous system (CNS) disorders. What is the most important information I should know about Zeniquin? Zeniquin is a prescription medication FDA-approved for veterinary use in dogs and cats. Zeniquin is available as 25 mg, 50 mg, and 100 mg film-coated scored tablets. Always follow the dosage instructions provided by your veterinarian. Do not give Zeniquin to any pet other than the pet for whom it was prescribed. Zeniquin is not for use in pets allergic to it or other fluoroquinolone antibiotic drugs. Zeniquin should not be used in cats younger than 12 months of age, or dogs during their rapid growth phase which can vary from 8 to 18 months based on the breed. Zeniquin may affect the retina of cats. What should I discuss with my veterinarian before giving Zeniquin to my pet? Tell your veterinarian if your pet has seizures or other central nervous system (CNS) disorders, or if your pet is breeding, pregnant, or lactating. How should Zeniquin be given? Give Zeniquin exactly as directed by your veterinarian. Give all of the medication your veterinarian has prescribed. Symptoms may start to improve before the infection is completely treated. The usual dose of Zeniquin for dogs and cats is 1.25 mg per pound given once a day, but the dosage may be increased to 2.5 mg per pound. For the treatment of skin and soft tissue infections, Zeniquin tablets should be given for 2-3 days beyond the cessation of clinical signs for a maximum of 30 days. For the treatment of urinary tract infections, Zeniquin tablets should be administered for at least 10 days. If no improvement is noted within 5 days, the diagnosis should be re-evaluated and a different course of therapy considered. If you do not understand the directions, ask your pharmacist or veterinarian to explain them to you. What are the potential side effects of Zeniquin? Stop giving the medication and seek emergency veterinary medical attention if your pet experiences an allergic reaction (difficulty breathing; closing of the throat; swelling of the lips, tongue or face; or hives). Other less serious side effects may also occur. Continue to give the medication and talk to your veterinarian if your pet experiences loss of appetite, vomiting, diarrhea, dizziness, or drowsiness. Side effects other than those listed may occur. Talk to your veterinarian about any side effect that seems unusual or bothersome to your pet. What happens if I miss giving a dose of Zeniquin? Give the missed dose of Zeniquin as soon as you remember. However, if it is almost time for the next dose, skip the dose missed and give only the next regularly scheduled dose. Do not give a double dose of the medication. What happens if I overdose my pet on Zeniquin? Seek emergency veterinary medical treatment. Symptoms of overdose may include loss of appetite, vomiting, dehydration, excessive salivation, tremors, reddened skin, or facial swelling. What should I avoid while giving Zeniquin to my pet? Do not give Zeniquin to pets allergic to it or other fluoroquinolone antibiotics. Do not give Zeniquin within 2 hours of administering Carafate (sucralfate), or other antacids or foods and supplements containing iron, aluminum, calcium, magnesium, and zinc. What other drugs will affect Zeniquin? Drugs other than those listed may also interact with Zeniquin. Talk to your veterinarian or pharmacist before giving any other prescription or over-the-counter medications. How should Zeniquin be stored? Store Zeniquin below 86°F (30°C) away from moisture and heat. Keep this medication away from children and pets. Where can I get more information about Zeniquin? Your pharmacist has additional information about Zeniquin written for health professionals that you may read. Zeniquin should not be used in cats younger than 12 months of age or dogs during their rapid growth phase, which can vary from 8-18 months based on the breed (small and medium breeds up to 8 months of age, large breeds up to 12 months of age, and giant breeds up to 18 months of age). The usual dose 1.25 mg/lb of pet's body weight given once a day, but the dosage may be increased to 2.5 mg/lb of pet's body weight. For treatment of skin and soft tissue infections, give for 2-3 days after symptoms are gone, for a maximum of 30 days. For treatment of urinary tract infections, give for at least 10 days. However, if there is no improvement after 5 days your pet should be reevaluated. Store Zeniquin below 86F (30C), away from moisture and heat.